Abbey Brook is N.C.C.P.G. National Collection holder of this genus. There are over 500 accessions which includes all species, varieties and forms and a large number of plants with provenance and field data. It also includes many of Coles numbers. 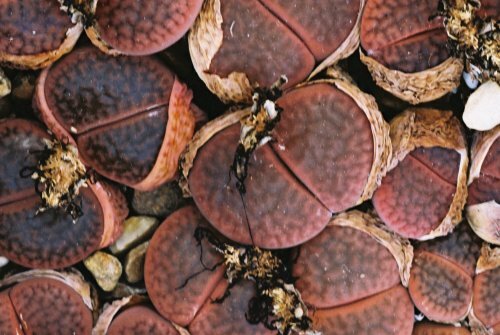 Although Brian was the first to hybridise Lithops in the 1960s with the aim of determining relationships between species and varieties, we are not particularly interested in artificial cultivars, and refuse to name any of our own. We believe that there is enough variation in the natural populations to satisfy most collectors. The collection has scientific status, the top designation for a National Collection. My mentor for this genus was the late Dr. H.W.deBoer, who lived near Groningen in Holland. In the early 1960s I spent many happy hours with him in his greenhouse and conservatory, just talking Lithops. I owe my knowledge and enthusiasm for this genus to him. 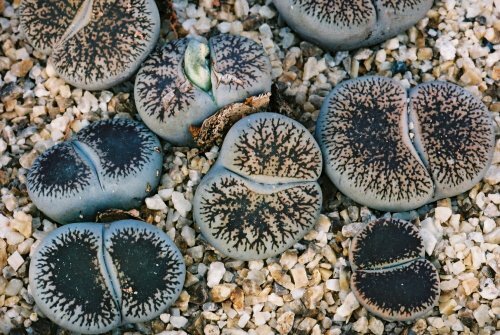 He encouraged me to write up my work on the genus Lithops, for which I was awarded a Master Degree by Sheffield University in 1969, for a thesis entitled The Taxonomy and Phytogeography of the genus Lithops. We always have a wide range of Lithops plants for sale at the nursery.